Abdul Basit could not be hanged under jail rules because he is in a wheelchair. PAKISTAN HAS POSTPONED the execution of a paraplegic death row convict following appeals by human rights groups. 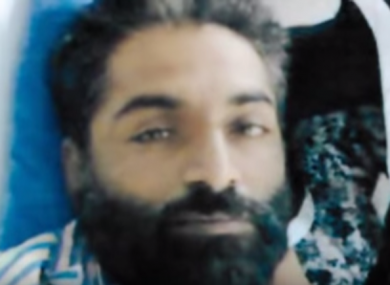 Abdul Basit, 43, who was convicted of murder in 2009, contracted tubercular meningitis in 2010 while in prison which left him paralysed from the waist down, according to rights groups and jail officials. Basit was due to be hanged on today, but a court delayed the execution after Justice Project Pakistan, the human rights law firm handling his case, raised concerns about how the man would mount the scaffold as he uses a wheelchair. “The hanging has been postponed. A magistrate in the morning ordered the postponement because Abdul Basit is a disabled man,” said Usman, an official at Faisalabad jail where Basit is being held and who goes by one name. According to Justice Project Pakistan, prison guidelines require that a prisoner stands on the gallows and the rope’s length is determined by his standing height. They said in a statement last week that attempting a hang a convict in a wheelchair may not work. Basit’s mother Nusrat Perveen also confirmed the execution delay, telling AFP that a jail official had called her to inform her “the hanging has been postponed because of Basit’s sickness”. Pakistan has hanged more than 200 convicts since ending a six-year moratorium on executions last December, after Taliban militants massacred more than 150 people — mostly children — at a school. But critics say the legal system is unjust, with rampant police torture, poor representation for victims and unfair trials. Email “Pakistan wants to hang a paraplegic wheelchair user”. Feedback on “Pakistan wants to hang a paraplegic wheelchair user”.